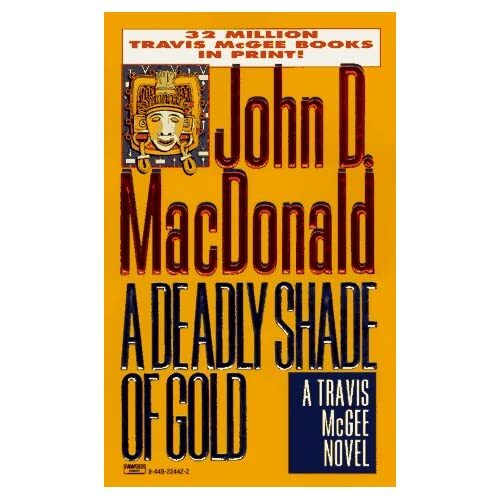 One of the first writers I read as a writer, and not just as a reader was John D. McDonald – and specifically his Travis McGee private eye series. I found his books in the Peace Corps library in Honduras. Now you have to picture the volunteer’s library as a large shelf of mostly paperbacks next to the nurses office where you get shot in the but with gamma globulin twice a year. Always some interesting sounds coming out of that place. The couches outside in the courtyard were where you waited for your turn to get shot. The bookcase was next to couch furthest away from the nurses door. In Honduras I read a lot. I’ve always read a lot, but in Honduras, without TV and with lots of long car, bus, and walking trips to occupy my time with a good book, sometimes two was a must have in the backpack. I picked up The Scarlet Ruse first, then worked my way through the 20+ books in the series. A group of four of us traded them back and forth reading them together over two and a half years. What I loved about McDonald’s series was the hard-boiled atmosphere, the floating houseboat called the Busted Flush, the alcohol consumed, the beautiful women who showed up as damsels in distress, the sidekick Meyers, and the violence, that could come out of nowhere and end as quickly as it began. One book, though really made me stop and think about the whole writing process. I mean this was a genre book that followed the formula of a mystery. But this one book, A Deadly Shade Gold, turned the genre on its head. No book after it in the series played by the rules either. About half way through the book the mystery is solved. I remember wondering what the rest of the book was going to be about if the mystery was already solved. But there was no need to worry. Travis McGee was such a fascinating character and I was so involved with what happened to him, mystery or no mystery, that I’d basically follow him anywhere. And for each of the books after that, I did. The story transcended its form. Character, in this instance,was more important than plot. Character isn’t all, but if your character is good enough the reader will follow you far and wide, from jungle to desert and back again. This entry was posted on November 7, 2011 by Joe Lunievicz. It was filed under Blog, John D. McDonald, On Writing .